It’s not often that I attend the theatre. This year I am determined to go more – even if it means going solo. 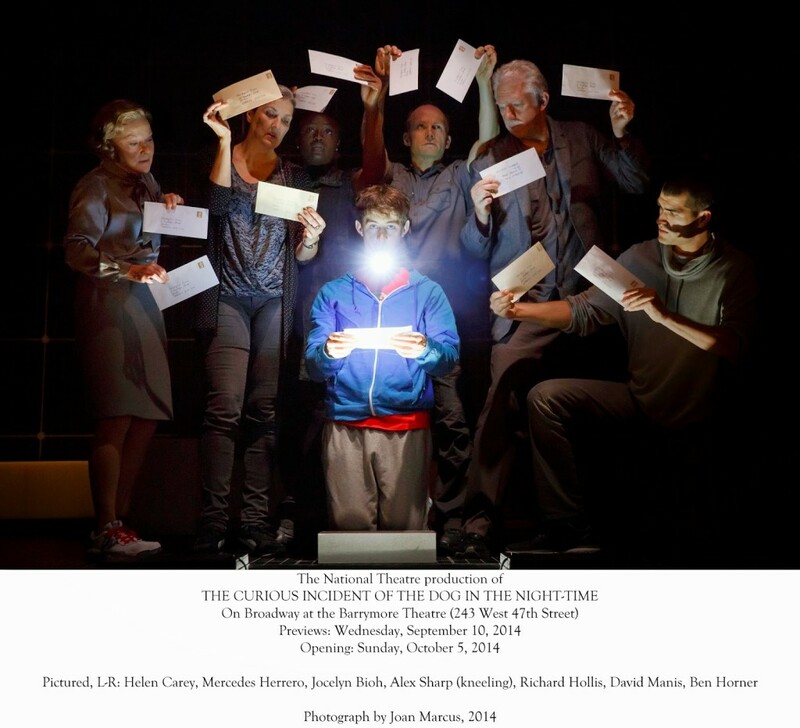 I was fortunate to be provided with 2 comp tickets to see The Curious Incident of the Dog in the Night-Time last week. And luckily, I didn’t have to go by myself. 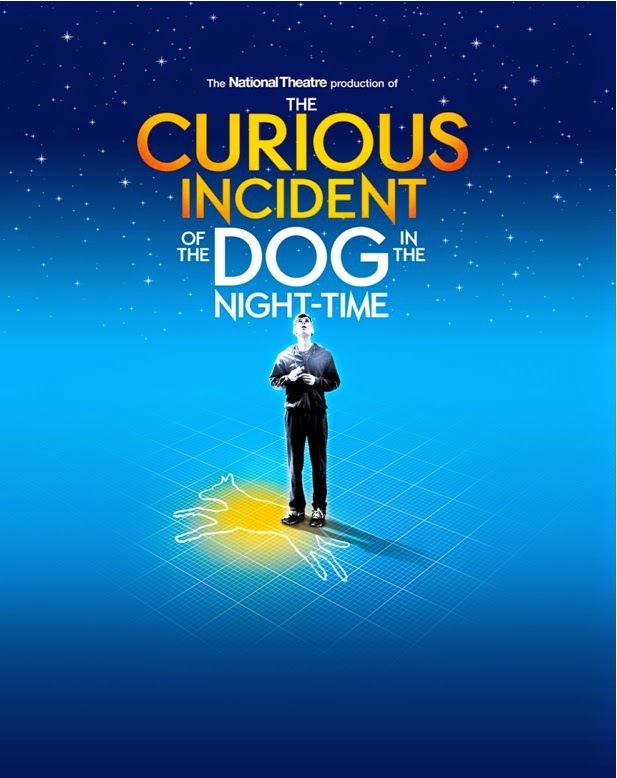 I heard of The Curious Incident of the Dog in the Night-Time written by Mark Haddon and I knew it was adapted into a play. Honestly, I didn’t think the book or play was for me. Yes, I knew it had something to do with autism but I’m not really into mysteries so I put it on my one-day-I’ll-read/see-it list. And if I’m being completely honest sometimes I don’t always want to read/watch things related to autism. I live it, remember? 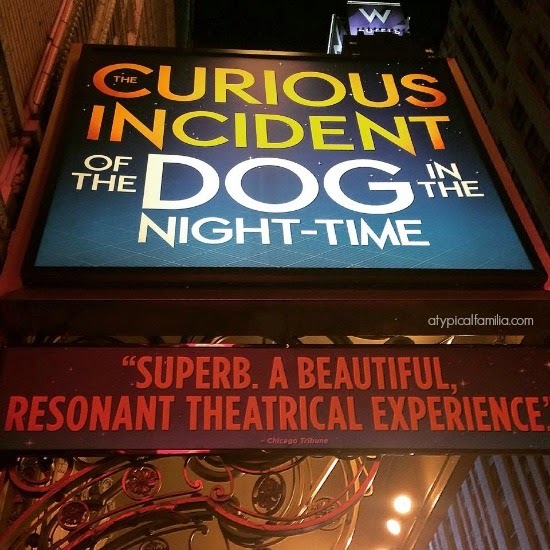 A few weeks ago Norrin’s godfather, aka Nino, went to see Curious Incident. He admitted he had no idea what he was walking into. He thought it was going to be a happy Broadway musical about a boy and his dog. “About 20 minutes into it, I was balling my eyes out…it just made me understand Norrin and you guys so much more.” And then he went on and on about what he loved about it. Coming from someone who has known Norrin his entire life – meant a lot. If Nino felt that way about it, Curious Incident needed to be bumped up on my list of things to read and see. So I downloaded the book to read during my commute (which was probably a mistake because I fought back tears – okay fine, I was sobbing on the 6 train) and finished it before going to the play. I loved the book but wondered how it would translate. Have no idea what Curious Incident is about? So now, about the play. I may not get to the theater as often as I’d like, but I’ve seen my fair share of shows over the last 30 years. (I saw my first Broadway show when I was 9.) And I’ve never, ever seen anything like Curious Incident. If I questioned how it would transition from page to stage – I shouldn’t have worried. 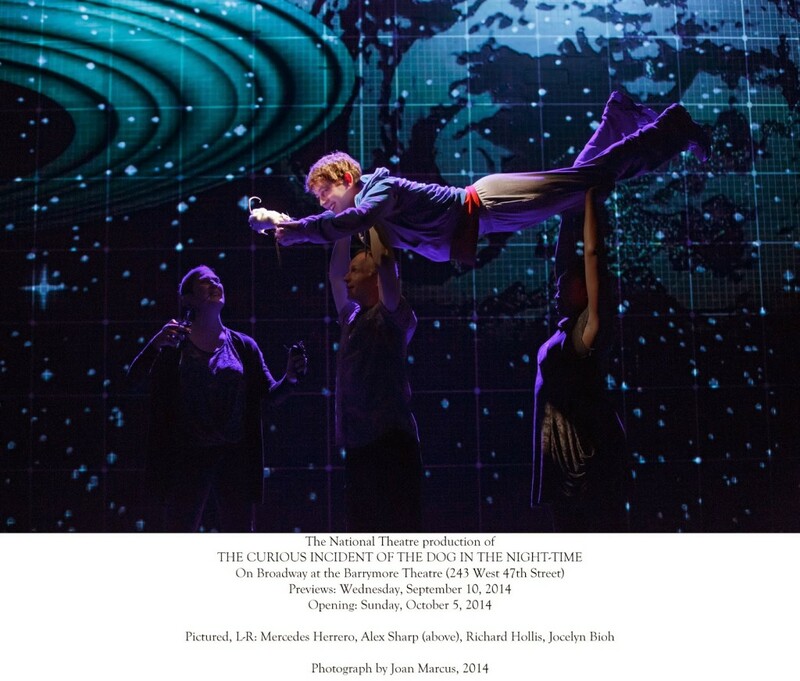 Called “one of the most fully immersive shows ever to wallop Broadway” by The New York Times, THE CURIOUS INCIDENT OF THE DOG IN THE NIGHT-TIME is a record-breaking theatrical phenomenon that simply must not be missed. The book was visual and intense and I identified with Christopher as well has his parents. And I cried through most of it because I saw some glimpse of our lives and our future in theirs. But seeing it on stage, I was in awe. I’ve read books (both non-fiction and fiction) and I’ve seen a movies and plays about autism. And like I said, I live with it – granted Norrin is not like Christopher – so I like to think I have a good understanding of autism. 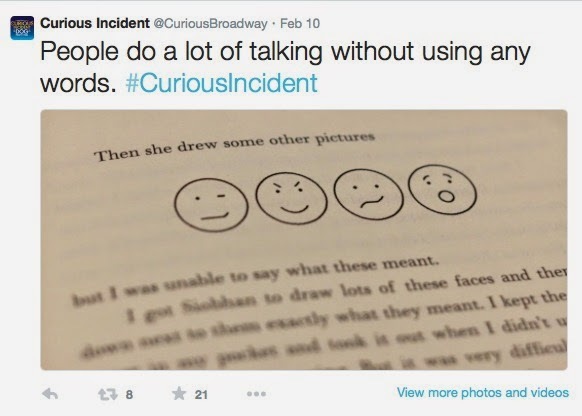 But I’ve yet to experience anything that made me see it or feel it the way Curious Incident did. There is one scene in particular – it takes place in the subway; it was loud and bright with lots of flashing lights. And I thought about Norrin since we take the train often. When Norrin was younger, it was hard. He’d cry and scream and cover his eyes with his hands, hat or shirt – I could never understand it. The scene in Curious Incident created a sense of panic for me (I’ve taken the subway my entire life and I’m fine with it) and it made me realize how overwhelming and frightening the subway could be. I identified with Christopher’s mother – a woman who once had dreams and great expectations. And then she has a child with special needs and she doesn’t quite know where her dreams fit in. She’s torn between the love for her child and her love for life. And Christopher’s father (who reminded me so much of Joseph) is the one that holds the family together when all falls apart. He is patient, loving and scared. The father and son relationship is beautiful to watch and the tenderness is palpable. But it was Christopher, played by Alex Sharp, who moved me the most. He is heartbreaking, humorous and hopeful. There’s such a physicality to Christopher’s role – moments where he was actually carried across the stage – that wasn’t in the book. It was that physicality paired with the dynamic visuals that provided insight into Christopher’s autistic mind. There was only one small moment at the very end of the play (that wasn’t part of the book) I wished was different. I can’t even talk about it because it may ruin it for you. I don’t know…I could have misinterpreted it. But if you’ve seen the play, maybe we can chat privately about it. Because I’d love to hear your thoughts. 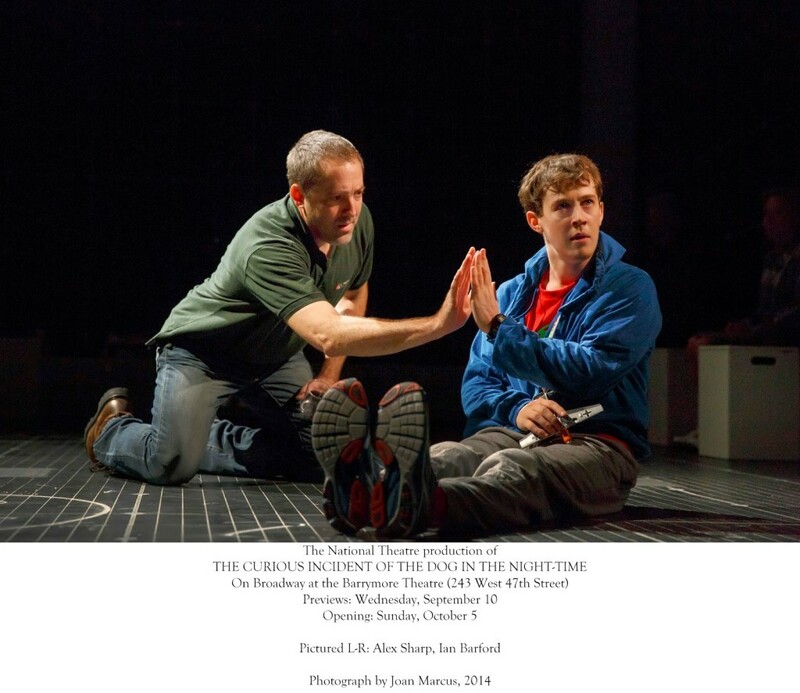 The thing is, Curious Incident isn’t a story about autism – it’s a human experience, a coming of age story, autism just happens to be part of it. And if you’ve read (and loved) the book and are uncertain about seeing the play – don’t be. You will not be disappointed.